Description: At 4:04 PM in what seems to be a blur is K276 heading north towards Manville. Description: Unit trash train K277 comes west out from under the arch at Chestnut Street on track 2 looking to make a pick up from track 3 at Grays Ferry. Description: 2209 switches while a southbound River Line freight coasts through town on the double track. Description: A CSX stack train outruns a violent thunderstorm approaching Calhoun. Description: CSX WB with CSXT 4824 crosses the Erie Canal. Description: CSX 4824 leads an eastbound coal train through downtown Cumberland. 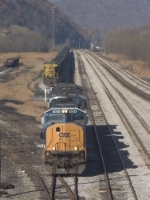 Description: CSX 4824 leads a coal train through downtown Cumberland. Description: SD70AC leads CSX general freight Q438 eastbound by the B&O cpl signals around the curve on 1 at Eastside Yard. Description: A YN3 70MAC duo leads a Q406 north at Holmes on a dark day. Description: A pair of SD70MACs pass by at an amazingly slow pace. Description: Eastbound on the Philly Sub.